Letter addressed to Messrs. Mandal and Co. from Mahesh Chandra, dated September 17, 1919. In the letter, Chandra resigns from the Nalanda club and explains his decisions for doing so. 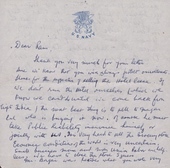 Letter written by Mahesh Chandra to Ram Bagai concerning the sale of property including a hotel and grocery store, ending with a nostalgic description of Vaishno Das Bagai. Mahesh was a close friend of Vaishno and Kala Bagai before Vaishno's death in 1928. This letter was written at the same time as a letter by Kala Chandra, also reminiscing about Vaishno Das Bagai.